Want to create a massive low end in your tracks and mixes? 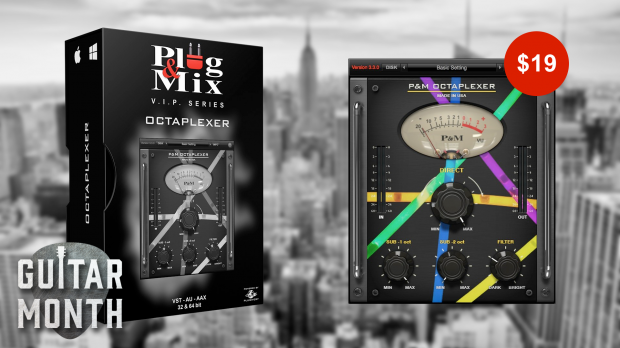 Octaplexer will make any sound it is applied to more solid and prominent. On promo now. Missing some extra low end in your mix? Want the main guitar or synth riff to have a bass duplicating it to give a really “solid” feel? This effect mixes input sound with two generated signals that are one and two octaves below original pitch. DRY – Controls the level of the input sound in the mix. -1 OCT – Controls the level of the sound one octave below in the mix. -2 OCT – Controls the level of the sound two octave below in the mix. FILTER – Filter control used to adjust timbres of the generated signals. This entry was posted in DontCrack, Plug & Mix, Plug-ins, Promotions and tagged Guitar octave pedals, Octaplexer, Plug & Mix, Plug and Mix. Bookmark the permalink.